This Keystone comedy goes in different directions to the more standard “park comedies” I’ve been reviewing recently, and is generally a stronger example of “situational” rather than “slapstick” comedy. 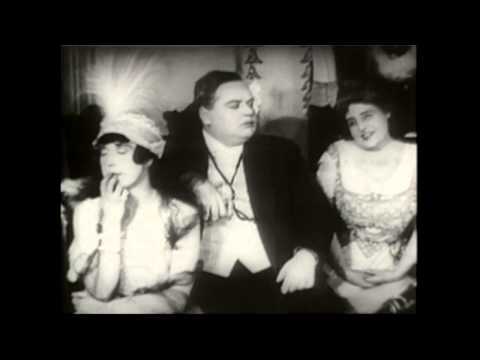 This time, Roscoe “Fatty” Arbuckle is married to Mabel Normand, but will his philandering and her demanding mother-in-law destroy the relationship? Our story begins with Fatty and Mabel in the back seat of a large, well-appointed automobile (no lowly farm couple in this outing!). Fatty produces a ring and Mabel expresses joy: we see that they are happy together and on the road to marriage. We next see them entering the courthouse, and wedded inside, in front of witnesses. Soon, the scene shifts to their state of domestic bliss – sort of. Mabel sits in front of a mirror weeping as Fatty stumbles home drunk, and presumably late). Her mother (Alice Davenport) is there, and expresses her disapproval in the strongest possible terms (jabbing Fatty in the gut with his cane, for example). Fatty makes a pass at the maid in her view, which does nothing to improve her temper. Fatty reluctantly puts on evening clothes and joins the two of them to drive to the opera. In the car, mother-in-law objects to Fatty’s smoking a cigar, which only heightens tensions. Meanwhile, Ford Sterling arrives at the opera with his wife and “a friend,” a young woman whose dress shows a lot of her arms for 1915 (May Emory). As they settle into their box, she attracts a good deal of attention from the male members of the audience, and Ford keeps trying to look down her dress. When Fatty’s party arrives, he resists entering the opera, but finally concedes, and they take to booth opposite from Ford’s party. 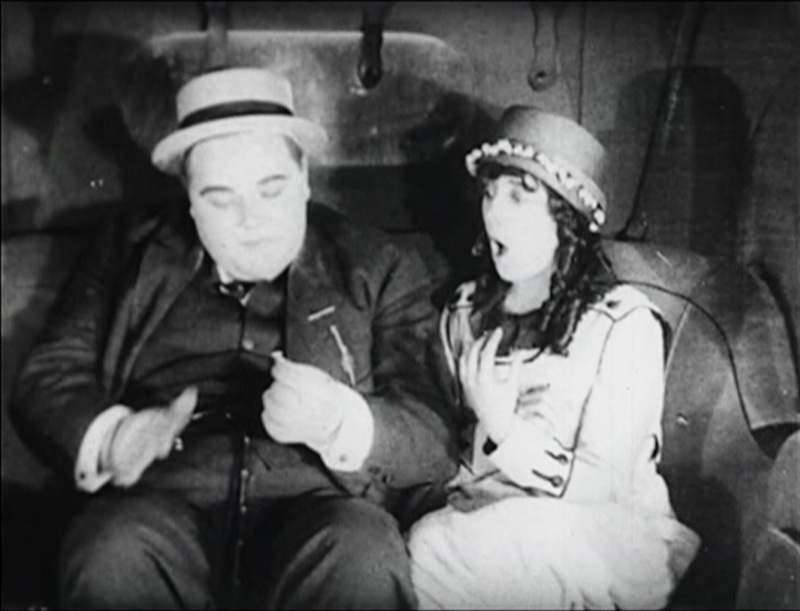 During the show, Fatty consistently displays his disinterest in the opera, and Ford continually displays his interest in the young woman. They notice each other not watching the opera and signal to each other, Ford trying to do so without his wife observing, and Fatty without alerting his mother in law. Finally, they arrange to meet in the lobby, Fatty leaving Mabel and Alice behind, and Ford bringing both of his women companions. Ford’s plan (we mostly figure this out from body language) had been for Fatty to entertain his wife so that he would have a chance to sneak off with the floozy, but it doesn’t quite work out that way. Ford and Fatty go through a show of recognizing one another, and making introductions, and instantly the floozy gravitates to him, the wife barely noticing. Fatty and May go out to a neighboring restaurant together, and Ford drags his wife along as well. He keeps trying to get back with the young woman, but both she and Fatty consistently prevent it. Finally, Ford loses patience and goes to use the telephone. He calls the opera and pages Fatty’s wife, telling her that he is at dinner with “a strange woman.” Mabel and her mother head over and catch Fatty, and Mabel bursts into tears. Fatty figures out what has happened and breaks a bottle over Ford’s head, resulting in everyone getting thrown out. The next scene shows Fatty and Mabel’s reluctant divorce, urged on by Alice and the judge. They meet again outside the courthouse, sweetly make up, and go back inside to get married. While hardly devoid of violence, this is a less “slapstick” movie than we’re used to from Arbuckle, and it deals with somewhat more grown-up subject matter, including the concept of divorce. Divorce was already a part of the Hollywood tradition, but it was largely unspoken and not treated in screenplays except as a social evil. The happy ending here prevents it from being too serious, and in fact I hoped that Fatty and Mabel will end up all right – their chemistry always seems to suggest that they should be a couple, even in movies that separate them – but this movie does take us right up to the edge of the unthinkable. It’s interesting to note the implication that marital troubles can all be laid at the feet of the nagging mother in law, never mind the fact that Fatty definitely behaved inappropriately on several occasions here. I quite enjoyed Ford Sterling’s performance as the hopeful masher. He was not known for his subtlety, but in the right role his over-the-top facial expressions and body language can be hilarious. There’s also some interesting parallels with Chaplin’s “A Night in the Show,” which also involves shenanigans in a public theater, although Chaplin brought his own unique style to that film. This movie avoids toppling over into the riotous mayhem we might expect, particularly from a Keystone production, whereas “A Night in the Show” pulls out all the stops. Arbuckle and company seem to have been out to prove they could be funny without doing a giant chase scene or fight at the end, and even sneak in some sympathy with the happy ending. 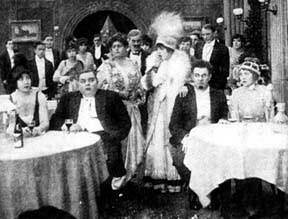 Cast: Roscoe “Fatty” Arbuckle, Mabel Normand, Ford Sterling, Alice Davenport, most of the Keystone company in audience. You can watch it for free: here (no music) or here (with inappropriate organ music).